Hallie Levine wrote for AARP thatHigh-fat dairy products (such as yogurt and cheese) have been linked to lower type 2 diabetes risk. If you’re old enough to remember when oat bran and spinach earned all the nutrition gold stars, experts say it could be especially important that you check out today’s short list of tastier superfoods. “Food is really medicine, especially as you get older and are concerned about staying at a healthy weight while reducing your risk of conditions such as type 2 diabetes and heart disease,” says Tonia Reinhard, a professor of nutrition at Wayne State University in Detroit and author of Superfoods: The Healthiest Foods on the Planet. Here are the eight items experts say to put on your grocery-shopping list today. The active ingredient in this earthy-sweet spice is called curcumin, and it appears to offer a trove of health benefits, including one you might want to write down: improving memory and mood in adults over 50 who have mild memory loss, according to a University of California, Los Angeles, study published in March. Curcumin is also a potent anti-inflammatory, says Cynthia Sass, author of Slim Down Now: Shed Pounds and Inches with Pulses —The New Superfood. And other research reveals turmeric’s ability to shut down genes involved in the growth and invasion of cancer cells, improve liver function, lower cholesterol, protect against Alzheimer’s disease and fend off viral infections, adds Sass. Is there anything this miracle spice can’t cure? How to get it: Add it to an omelet, toss it into roasted veggies or rice, even sprinkle a little on your soup or salad, advises Reinhard. Sprinkling in a pinch or two should suffice; more than that can turn your teeth yellow. This Central European staple is so much more than glorified cabbage. It packs a huge nutritious punch because it’s fermented, which promotes the growth of probiotics, compounds that feed the good bacteria in your GI tract and, thus, lead to better digestive health, explains Dawn Jackson Blatner, author of The Superfood Swap: The 4-Week Plan to Eat What You Crave Without the C.R.A.P. And that could be important: A Swedish study published last year in the nature-research journal Scientific Reports found that bad gut bacteria can actually contribute to the development of Alzheimer’s disease. How to eat it: Make sure what you’re chowing down on is unpasteurized, as this type will have the most good bacteria in it, advises Blatner. Because sauerkraut is high in sodium, consider rinsing it in cold water before eating to get rid of some excess salt. Check out the easy make-at-home version here. The umbrella term for beans, lentils, peas and chickpeas, pulses are especially rich in nutrients and antioxidants. “They’re rich in B vitamins and minerals — including calcium, potassium and magnesium — and they are also packed with plant protein and fiber that extends fullness and delays the return of hunger,” Sass notes. There’s also evidence that pulses lower blood sugar. Older adults at risk for heart disease who consumed a little more than three servings of these foods each week had a 35 percent lower risk of developing type 2 diabetes, compared with those who had fewer than two, according to a study published last year in Clinical Nutrition. How to get it: Try to swap a serving of animal protein with a serving of pulses every day, suggests Samantha Heller, a nutritionist at NYU Langone Health in New York City and author of The Only Cleanse. Or just add it into a meal and keep the existing protein by, say, pouring a half cup of chickpeas onto your tuna salad. And it’s a myth that beans make you toot: Research shows that while about half of people who up their bean consumption have more flatulence, it eases up after a week or two. How to eat it: treat yourself to up to one serving of full fat dairy a day. “You don’t want to make all of your dairy full fat, as it does have more calories,” advises Reinhard. A whole can has under 200 calories, is packed with over 20 grams of protein, and serves as an excellent source of bone-building calcium (more so than a cup of milk! ), energizing B12 and immune-boosting vitamin D, says Blatner. And the rich, oily fish is also full of omega-3 fatty acids, which research suggests may help bust stress, boost memory and reaction time, and increase brain gray matter (the tissue associated with higher intelligence), she adds. 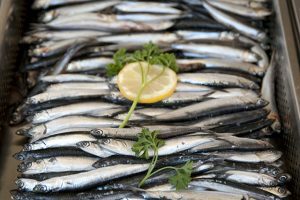 One 2016 Spanish study found that patients with type 2 diabetes who ate the equivalent of a 3.5-ounce can of sardines five days a week had higher levels of adiponectin, a hormone that helps fight inflammation in the body and reduces risk of heart disease. How to eat them: Blatner recommends just opening the can, draining them, squeezing in some fresh lemon juice and chopped fresh parsley, mashing it all together and digging in. You could also pair sardines with crackers, olives or a simple salad. Once a superfood, always a superfood. One cup of chopped kale has just 30 calories but provides more than 130 percent of your daily vitamin A and C needs — nutrients critical for a healthy immune system and healthy skin, both of which decline with age, notes Sass. And the leafy green’s vitamin K helps maintain strong bones, as does the nearly 100 mg of calcium per serving it contains. “Kale also contains natural substances that protect the bends and branches of blood vessels — areas most prone to cholesterol buildup and inflammation — making it a potent protector of your heart,” she adds. What’s more, a 2015 Rush University study found that seniors who ate one to two servings of leafy greens such as kale each day had the cognitive ability of someone 11 years younger than those who consumed none. It’s thought that vitamin K, lutein, folate and beta-carotene could be the keys for such brain health benefits, says Sass. How to eat it: You can always throw some into a smoothie or build a salad around it, but a supereasy and tasty way to enjoy kale is it to make it into chips, suggests Blatner. Take two bunches of kale (about 14 large leaves), toss them with 2 teaspoons of olive oil, place them in a single layer on a baking sheet, sprinkle them with nutritional yeast (a healthier version of parmesan) and sea salt, and bake for 18 minutes at 300 degrees Fahrenheit, until crisp. These fruits are chock-full of heart-healthy monounsaturated fat, which has been shown to improve cholesterol. People who eat an avocado a day have lower levels of the bad cholesterol, LDL, and higher levels of the good kind, HDL, than those who eat a similar diet without any, according to a 2015 study published in the Journal of the American Heart Association. Avocados are also packed with disease-fighting antioxidants and nearly 20 vitamins and minerals, including vitamins E and K, magnesium and potassium, notes Sass. And a review of studies published last year found that avocados help reduce the risk of developing metabolic syndrome — a cluster of risk factors such as high cholesterol, blood sugar, blood pressure and an increased body mass index that raise your risk of developing both type 2 diabetes and heart disease.